Win a 3-month Conscious Box Subsciption! "Jewelry Candles was inspired by the famous classic movie, Willie Wonka And The Chocolate Factory! We here at the company love that movie and thought it would awesome if we could have our own Willie Wonka type concept but instead of using candy bars and golden tickets we would use all natural soy candles and beautiful jewelry! If you remember in the movie there were only a few golden tickets won by a few lucky kids but with Jewelry Candles, everyone is a winner! Inside all our candles is a hidden jewel that can be worth anywhere from $10 to $7500. Inside your candle could be a ring, necklace, pendant, bracelet or a pair of earrings! You just never know what you are going to get but you will always get a gorgeous piece of jewelry!" below for a chance to win! So excited about this one guys!! Be SURE to enter!! Disclosure: I received no compensation for this publication. My opinions are my own and may differ from those of your own. What Dianna Thinks is not responsible for sponsor prize shipment. 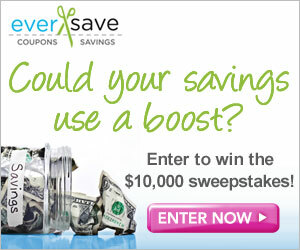 Join Eversave Coupons & Savings and enter the $10,000 Sweepstakes! WOOOO! Join Eversave Coupons & Savings and enter the $10,000 Sweepstakes! 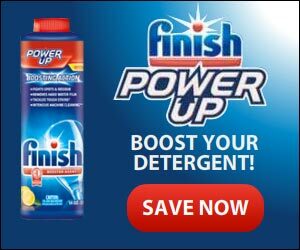 Sign up to receive a special coupon offer on FINISH Automatic Dishwashing products! Welcome to the Whitening Lightning Giveaway Event! Whitening Lightning Products Bring You a Brighter Smile! Whitening Lightning offers products to consumers that promote a brighter, whiter smile. Whitening Lightning products include their Dial a Smile Professional Whitening Kit, Whitening Lightning Super Booster Teeth Whitening Pen, Color Your Smile Lighted Lip Gloss, and their newest product to hit the market, the Brow Bar. Whitening Lightning has been featured in high profile magazines like In Style, Soap Opera Weekly, OK Magazine, US Weekly, and many more. 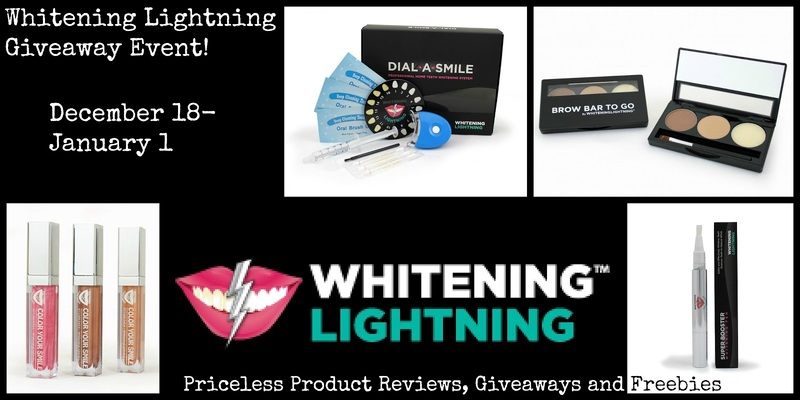 One lucky reader will receive a $588 Whitening Lightning product package consisting of a Dial a Smile Kit, a Whitening Lightning Super Booster Pen, a Color Your Smile Lighted Lip Gloss, and their newest product, a Brow Bar to Go! Giveaway ends January 1, 2012 at 11:59pm, open to US and Canada, ages 18+. To enter please use the Rafflecopter form below. Good luck! 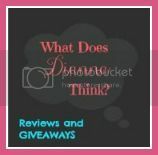 I know this is not a review, but it's such a big giveaway that it DESERVES its own blog post! This is a giveaway like no other! You will not believe the PRIZES we have for you!! We're giving away multiple prizes including Gift Cards, KitchenAid Mixer, Keurig Mini, a Dyson, and a believe it or not...a 3 month paid internship! This is a full 3 week event with prizes all throughout! Make sure to keep coming back to not only do daily entries but to check the winners list! What’s the Roo found for you? ™ Blue Kangaroo is a personal search engine for deals. Tell it what brands and products you’re looking for, and the Roo will start scouring the deal universe for the best offers to match. Through Web and mobile applications, Blue Kangaroo’s mission in life is to make sure you always get the right offer at the right time. “The Roo” is already monitoring deals from most major brands, flash sales, daily deals, loyalty programs, and even lots of local offers, too. It displays offers in a colorful format that’s fun to browse, kind of like Pinterest. With the Roo, you can… Explore the deal universe Follow offers from any brand or product you like De-clutter your inbox. Convert all of the marketing emails you’re currently getting in your Yahoo or Gmail personal inbox into just one crisp email every morning, letting you preview all of them quickly at a glance – a big time saver. (Note: this marketing-inbox service is strictly optional for contest entrants.) Helping others this holiday. The Roo is new startup designed by a small community of deal-lovers, many of them formerly from Yahoo. They have a strong commitment to helping others. During December, for example, Blue Kangaroo’s commission from all purchases by new members who elect to do so will be 100% donated to their choice of charity, including American Red Cross, American Cancer Society, and the United Way. A great time to get acquainted with Blue Kangaroo! 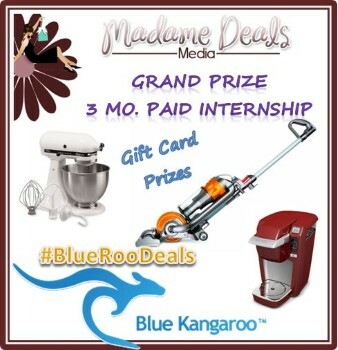 To participate in the contest activities by Madame Deals, ALWAYS link to Blue Kangaroo through this special tracking url: http://chzn.me/rc5 Otherwise, your activities may not be credited properly toward the contests. You can find Blue Kangaroo on their Website, Facebook and Twitter. (Prizes shown in images are just a representation and may not be exact prizes awarded. We will update the winner's list as they are drawn from the Rafflecopter so make sure you keep checking back and checking your emails for notification). You will enter via the Rafflecopter below and will be able to come back and do daily entries. Entries will be as follows: 1. Register and "Get Started" with Blue Kangaroo. (see here if you need help and for "how to") 2. Find 3 Deals you like on Blue Kangaroo and use the sites “share function” to share those deals to Facebook, Twitter or Email. (must share to anyone other than yourself) 3. New Daily Deal - you can earn additional entries daily for sharing a new deal or adding new deals to your board if you created one. 4. Internship - Sign me up! I'd like to compete for the job! (Find out more about the Internship from Madame Deals. If you'd like to compete for this 3 month job, you'll be doing all of the above and then instead of adding 3 deals to your board, you'll add 10 deals. We're looking for the Top Deal Finder. Someone who has great social media interaction, who shares their board and deals on their social media, who finds the best deals, etc. It will be a little bit based on chance when we draw from the list of participants but then we'll be looking over your boards so it will also be based on your skill of deal finding. You can watch Blue Kangaroo's Twitter feed and Facebook status's for helpful deal finding tips too! And may the best deal finder win!!) Contest will start at 12/16/12 12:00 am EST and end on 1/5/13 at 11:59 pm EST. Enter via the Rafflecopter Below. Good Luck!! a Rafflecopter giveaway Blogs are not responsible for prize fulfillment. Sponsor will be sending the prizes. Winning entrant will be emailed and be given 48 hours to respond before another reader is chosen. Giveaway is open to US and Canada residents only. Complete giveaway terms and conditions. Flirty Aprons 70% OFF with this code! 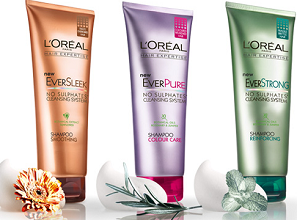 When you join the FREE L’Oreal Product Testing Panel men and women (18+ years) can participate in studies to receive FREE LOreal skin, hair, cosmetic products for their participation. Awesome way to try new products free! Wendy's chance to win a Mozzarella Chicken Supreme!